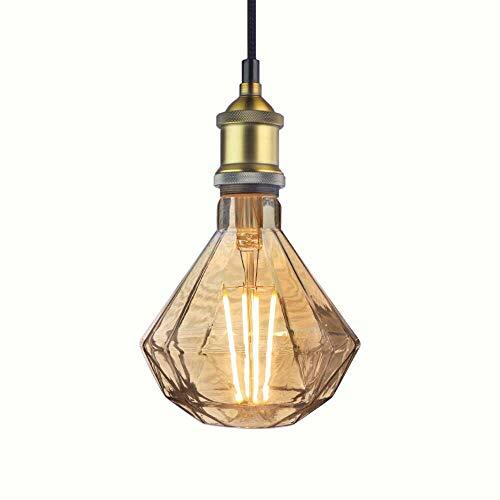 LA JOLIE MUSE PENDANT LIGHTS DÉCOR YOUR DREAM High-style pendant captures the essence of utilitarian chic, especially when outfitted with a vintage filament light bulb. The simply styled metal disc has a rich antiqued exterior finish and shiny interior finish to maximize the glow. Hang at your preferred height in entryway, over the kitchen table, or in a row over the dining table. DETAILS YOU’LL APPRECIATE ·Shade is made of iron, features a hand painted gold and nickel finish. ·Bulb is 6. W ·Hardwire; professional installation recommended. ·UL-listed DIMENSIONS Lamp holder: Aluminum lamp holder of matt brown bronze Rope Cord: 1m long of black fabric cable VDE; 2*0.0.75mm² Iron Bracket: D80*H25mm/0.6mm Socket: E27 Lamp socket. CE certificate Bulb: 6 watts, type A (included) Dimmable: No CARE AND MAINTENANCE Wipe clean using a soft, dry cloth or static duster. Avoid using harsh chemicals and abrasives as they may damage the finish. Do not exceed specified wattage.